Before that day happens, there seems an interminably long transition between winter and spring where a weave of infinite browns dominate the landscape. It was during one of these periods that my friend Rocky and I took a trip to Valdez. It was a long time ago in a life far, far away, back when I was…young… an airman stationed at Eielson AFB, 28 miles southeast of Fairbanks. I don’t remember much about the trip but there was a night we had to pitch our tent along the side of the road, at a construction pullout because the campground had five feet of snow blocking the entrance, we then woke up the following morning to six inches of snow surrounding us. All this and not a single body of fish-able water that was free of ice. Spring was obviously, not upon us. Taking a break on the 340 mile trip back to Eielson, somewhere outside of Delta Junction, we stopped to stretch our legs. We walked up to a flat lookout area and I noticed just the slightest hint of color, a pale lavender seeping out of rocky, brown, ground. In a land where most flowers are very tiny, this Pasque flower (the first I’d ever seen), looked enormous, out of place, out of time, and, absolutely marvelous. Spring WAS coming, this was proof. The leaves would come out on the trees, the mosquitoes would return, the lakes would free of ice and the lure of fish would once again become the reason to go on an adventure. 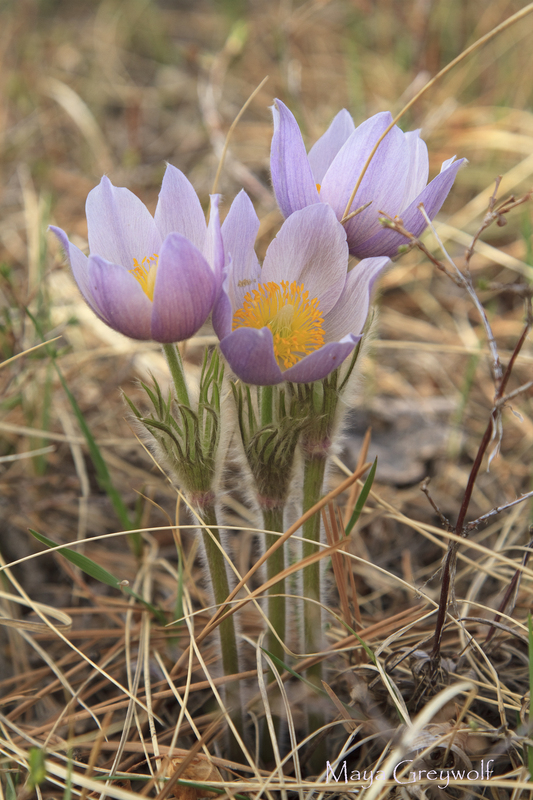 I don’t think I ever saw another Pasque flower, up until two weeks ago when I spied this lovely bunch near Custer, SD. I have since learned it is South Dakota’s state flower. Thank you Daily Post: Spring for the inspiration. Wonderful story, and photo, too.